The wine has been resting in my cellar for the past six and a half years – about optimal for most Washington merlots. But Mrs. G and I were, to put it mildly, dazzled by its condition. Still bright and cherry red, it opened immediately with fresh fruit flavors, then evolved in the glass over the course of an hour. I’m quite certain the wine would have gone longer had we been able to keep from guzzling it down. It was flat out delicious. But best of all, it moved. The flavor changes kept coming every few minutes. It thickened and deepened, turning to a lush plum and baked cherry fruit bomb for awhile. Then it stiffened, and more mature elements of forest floor and leaf crept in. It slowly began to show more acidity, and hints of volatility in the aromas, suggesting its future path. At all times it was fascinating and balanced. I can’t recall who was the winemaker at Northstar in 2000, but Merf, the current winemaker, had a hand in finishing this excellent wine. 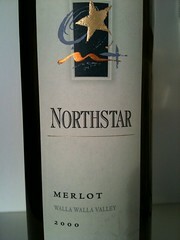 Out of 21 reviews for 2000 Northstar merlot on CellarTracker only three refer to the Walla Walla bottling, the most recent being from April of 2007, with the rather odd complaint that “by the third day of being open (even though it ws vacuum sealed) it was tasting a bit puny.” Jeez Louise! The third day!?! I’d say that’s a winner, vacuum sealed or not. And how did it not get consumed by the third day? My bottle didn't last three hours! Of course, with any older wine from anywhere, how it was stored has everything (and sometimes nothing) to do with how it will age. Tomorrow I will tell you the story of another fabled bottle, purloined from the “cellar” of Jimmy the Fish. A cautionary tale, to be sure. I believe Gordy Hill was the winemaker before Merf, so he could have been the one who made this particular wine. He is now the winemaker at the Wahluke Wine Co. I think this was the interesting year Rusty Figgins was at Northstar. Gordy for shure, Rusty's bottling came out with the silk screen label, 02 or 03(??). Merf was beside Gordy I believe from the begining back when Gordy's office was in the old Grandview facility. Paul, I'm with you, a bottle that good shouldn't last three days! Most of my bottles are consumed within 3 hours too. Thanks for sharing your Open That Bottle Night! Gordy was indeed the winemaker for the delicious 2000 vintage - he was with Northstar from '99 to 2005. Rusty only made the '02 vintage. Merf's been around for quite a while, but has only been the full-fledged winemaker at Northstar since the '06 vintage - present vintages. Merf is doing an absolutely amazing job, if I do say so myself. I got to sit in on a company sampling of the library merlots last weekend that included a sneak preview taste of his unreleased '07 merlots as a special treat last weekend and I thought the '07's were especially phenomenal and can't wait for them to be released.